You are here: Home / format Windows / What is the difference between a partition and a hard drive? People often get confused when it comes to distinguishing between a partition and a hard drive because on the actual computer, viewing them through the Windows Operating system, they look exactly the same. You might have one hard drive that is partitioned into four sections, however in my computer it will appear as four hard drives all labeled with their own drive letter. This is quite deceiving to the unsuspecting newbie as it may appear that there are more hard drives that there actually is. As you can see from the screen shot below, my main hard drive has been partitioned into 3 sections. C: drive, D: drive, and E: drive. This was a 500GB hard drive that now looks like three separate hard drives which are in fact partitions. If there were no partitions C: drive would be 500GB. But C: drive is only using 116GB of the 500GB that was available. You can also see J: drive and H: drive look like more hard drives or partitions but are infact an external 250GB hard drive connected to my computer. It has two partitions. Therefore when viewing my hard drives and partitions in my computer, you cannot tell the difference between a partition and a hard drive. A hard drive or hard disk drive is a physical computer component that is used to store your computers files and data. The hard drive needs to be attached to the motherboard for a computer to function. You can install more than one hard drive into a computer or even have an external hard drive connected. A partition cannot exist without a hard disk drive. You can divide your hard drive into sections which are called partitions. A hard drive volume can have as many partitions as you like, however it can become confusing. I like to have 3 main partitions, one for the operating system, one for the files, and one for backup. 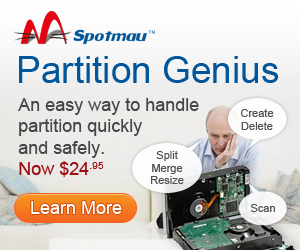 Why should you partition your hard drive into sections? You need to have at least one small partition on a hard drive to install Windows. You can save all your files on a separate partition and still format C: drive without touching the files. It helps organize files into sections. How can you tell the difference between a partition and a hard drive? You cannot tell the difference between a partition and a hard drive in my computer but you can in your computers disk management section. How to find disk management? Go to the Start Menu, choose control panel. Then Double click on the Administrative Tools. Right click on my computer or computer for Windows Vista. Once you have opened the disk management window you will see your hard drives listed as Disk 0, Disk 1, and so on. Any partitions created under Disk 0 will be in the Disk 0 line. C: drive is usually the default system volume where you will boot into to start your computer and the Operating system. Disk 0 in the screenshot below is my main hard drive as explained earlier. The status of the hard drives are listed as healthy and in brackets it tells us if the drive is merely a partition or a physical hard drive. Therefore to find out if a drive is actually a hard drive you will be looking for Disk 0 and Disk 1 and so on. If you only have one hard drive then it would be Disk 0 with the partitions listed next to it. A Primary partition is usually the partition with the system files and the boot sector files on it. A logical drive is a partition of the main hard drive. See the legend at the bottom of the screenshot. Primary partition = dark blue. An extended partition is a partition that is not formatted or assigned a drive letter. If your hard drive dies then you loose all the data on all the partitions it had. Therefore it may be better to have a separate hard drive for backup. Wow, I really wanted to read this b/c I need the information. But I can’t get past the grammar and typos.